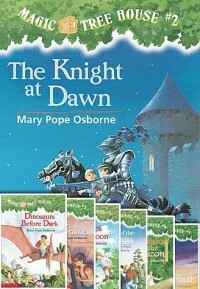 My cousin is 9 and loves Magic Treehouse, I never read these growing up but always had friends that did. There are so many in this series and I think they are a fun example of how reading can take you places. Jack and Annie are the main characters and every book is a different place they travel in their "magic treehouse". My cousin is in 3rd grade now but started reading them last year in 2nd. My CT last semester read these as an end of the day read aloud to her first graders and they loved them as an introduction to chapter books.